This is a love story. Daydreaming, heart-racing, hard-to-be-apart sort of love. And I’m not cheating on my first love (the outer banks of NC). This is different. This is like choosing between your two favorite desserts. Anyone with any sense would take both, right? The historic district of Savannah, Georgia takes my breath away! 1733--The clever Mr. Oglethorpe, founder of the colony of Georgia, picked a site ten miles upriver of the Atlantic for his carefully planned city of Savannah. Today we can thank him for an easily walked 2.5 square mile grid of Antebellum homes and churches—Georgian, Federalist, Italianate and Victorian styles. Within, you'll find twenty two 'squares', (tiny city parks). We must also thank the Savannah women who banded together to save failing buildings from the wrecking ball. In 1966, the area was designated a National Historic Landmark. A feast for the eyes. Lowcountry at its most elegant. Towering Live Oaks draped with Spanish moss. Cobbled streets. Historic homes. I can’t say enough about it. If you love history and architecture, walking or Paula Deen, this is the place for you. In October of 2007, my friends and I stayed at the Mulberry Inn and spent the better part of three days wandering. A guided trolley tour is a good way to get your bearings, or strike out on your own with the assistance of a free bus system. For a real treat, have lunch at Mrs. Wilkes' Boarding House. Well-hidden on one of the many elegant residential streets,it is a small restaurant in the ground floor level of a home. worth the effort. Check it out if you plan to make a visit. My favorite pastime was walking after dark. I became addicted to seeing the historic homes, the waterfront, cobbled streets and the cultural district by streetlamp. Have you visited Savannah or its sister city Charleston, and if so, what’s your favorite memory? You’ve heard of Paula Deen and lyricist Johnny Mercer but tell me: Who is Ellen Robillard? She seemed a bit confused about the actual year, but I was happy to get her take on 1860. Thanks for taking my virtual tour! Now, go eat your grits before they get cold. Did I tell you how much I love Savannah? From war-ravaged Lebanon to war-saved Savannah, if you believe the story about Sherman! 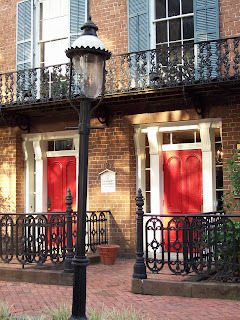 A few years back, I spent a lifetime in Savannah--over the course of a weekend. Hubby and I ensconced ourselves in an Antebellum home, strolled the local parks, dined Southern style in a way that would make even a N'Awlins lover proud, and yes, sampled pralines, all types! Yes, there's the Mexican style, gritty with sugar and spiked vanilla, the creamy, Southern lovelies, mountainous with pecans and a bit of cream...I'll stop now. It's 5:00 in the morning! Deb, I'm trying so hard not to be jealous. About three years ago, my father and I traveled to South Carolina to my son's graduation from boot camp. He was to have the entire weekend before he had to report for his next school in North Carolina, so we were going to spend the weekend in Savannah. Unfortunately, the mean drill seargant (sp? )made the group of our precious babies report within 24 hours. So we went to Charleston instead. Which was also lovely and beautiful and historic. My favorite memory of Charleston was walking around the old historic houses and the battery park along the water, and of course being with my baby who was about to become a man, and the time spent with my father (which I didn't know would be the last time I'd get to go on a trip with him). My son's favorite memory of Charlston was all the pretty girls we saw that day. Oh, I meant to say, good morning Virginia! Your name always reminds me of the other wonderful place I visited four months later after my son graduated from his school in NC, we went to Williamsburg Virginia. That cute little place is so inspirational to me. So every time I read or write your name, I think of those happy memories when my son and I were put in the stocks. Oh, I'm excited to share in your stories this morning. If we can't go back to our favorite places, thank God we can at least recall the pleasure of our visit. Patti - Somehow I knew you'd have made it to Savannah. I love your phrase 'spent a lifetime' over the course of a few days. Virginia - we took photos in front of Paula's restaurant. She's a favorite (the orginator of my favorite caramel apple cake recipe!) but we didn't eat there. That's one thing I love about her show, too-- little snippets of Savannah life! Jessica...seems you're close enough to make this a weekend getaway IMO! Being such a GWTW fan, I recalled the scene in the sequel "Scarlett" (both book and miniseries) where Scarlett and Rhett walk the harbor front in Charleston. I'm sure I walked in their footsteps when I was there. Okay, yes, I know they are fictional but the lines are thin for some of us. We also visited the charming town of Beaufort, South Carolina. Loved it. And ate dinner in a seafood restaurant next to the Port Royal Seafood company. Do I digress? yes. Because Port Royal was the scene of important activity in one of my other favorite series from Diana Gabaldon. I suppose those characters aren't real either, are they? I'm not even trying not to be jealous! Savannah and Charleston have been at the top of my "to travel to" list for some time now. I keep thinking my best bet is to get there with my daughter who is a big Paula Deen fan. But as much as I know I'll love the food, it's the history in those places that calls my name. Thanks for whetting my appetite yet again, Debra! Yes, Virginia, Williamsburg is a great place to visit. I have lots of pictures and great memories. I can't wait to go there again. I had the best ham sandwich at this little restaurant. They used stone ground mustard. I can taste it now. Do you think a ham sandwich is a good enough excuse to travel across the country? LOL! I don't remember if I answered your other e-mail, but I am feeling much better now. I just really had a hard time getting to the computer and answering comments after that asthma attack. It really drug me (physically, not literally) out until last night. Anyway, I wanted to let you know I also have a great appreciation for the military and I always appreciate your comments. Virginia, I still want to get to Williamsburg. I took two of my kids there when they were high school age. Gave them the choice of Busch Gardens or Colonial Williamsburg. I'm sure I'd be a complete pain there, as I'd be gawking and asking every costumed employee more questions than they care to answer. You're nicely located on the east coast for these things. I'm a northerner, after all. It's a good 8-9 hrs for me. Deb, I didn't get to the east coast until I think four years ago. I went to visit my sister in VA about 6 months before my son joined the army. And I had never seen the Atlantic before, so I was really excited. One of the first adventures there was that the engine fell out of my sister's car on the way to Norfolk. We were just a tiny way from this really long bridge (and I'm so thankful we weren't on that bridge!) We waited three hours for a tow truck and while we were waiting, the outer edges of a hurricane was passing over. The tow truck came, and we had to ride in it across that bridge and back in the rental car because we had to get back to her son. It was my first hurricane. I don't care to repeat the experience. But I will go to VA again. You really need to get to Savannah. Boston was always my favorite city before I went there. For me it's history calling. Boston certainly has that excitement of colonial and 'revolutionary' fire. I'd recommend both cities for history lovers, but then, we can find it in all our little towns and big cities if we want to. Good Lord! 12 comments by 8:30 am. I haven't even read it yet. I'm just in shock :) Get back to you in 10 minutes or so. Wow, Deb, you should be a salewoman. What a charming tour that was. If anyone visits Williamsburg, I'll meet you there. It's only an hour away. We usually go up once or twice a year. And we often have season passes to Busch Gardens. You need to try the peanut soup. It's a classic. And you can still get rabbit stew at one of the pubs. I haven't been to Savannah, but it sounded a lot like the historic district in Richmond, which I love. 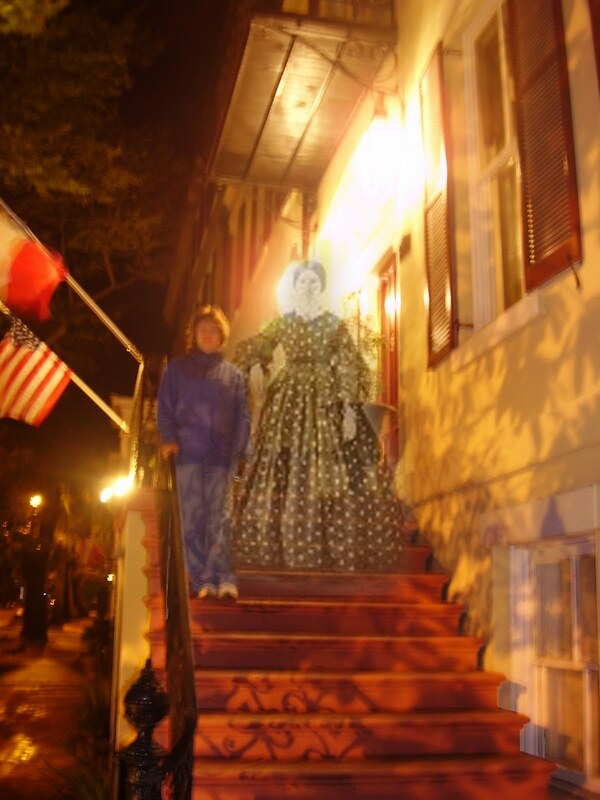 Debra, one of the things that I remember most about Savannah was the tour of historical homes. One of the homes had a vary narrow staircase with extremely small steps which led to the upper floor of the house. I am not short or little. Like a dummy, I went up that staircase. For some reason, I didn't think I could make it back down. I thought I was going to have to "grease up" with hand lotion and slide down! My friend started laughing at me, and that made it worse! Eventually, I slowly, slowly made my way down. The whole tour group was waiting for me at the bottom of the stairs. I resumed the tour with face red and head held high : ) I did purchase a tin of wonderful Key Lime cookies in Savannah to take home to my mother. I still have the tin, and I wish I had the recipe for those cookies! Suzie, you did answer my email. I hope you will soon be feeling 100%! Virginia is the Ham Capital of the world : ) Smithfield salty country ham on a biscuit, or served with grits and Red-Eye gravy!!! I live in a small railroad town. When I was a young girl, my mother and grandmother and I would travel by train to Richmond, VA. Another great Southern city! The dining car on the train served the best ham biscuits! We would stay in one the wonderful big old hotels in Richmond and spend several days shopping and just having fun. There were two fabulous department stores where we had charge accounts: Miller & Rhoads, and Thalhimer's. One of those stores had a little deli which served the most delicious chicken salad on croissants! I've been to Savannah before, but it has been awhile. I love the way y'all incorporate pictures on this blog, it makes it gorgeous. Hmmm... here are my two things: the apostle Paul and Thomas Jefferson. I can swear I smell ham. Seriously I did a lot of research into retiring to Virginia because it's such a great state. I have a book set in Roanoke (okay it's in my head.) At least it's close enough to visit. Dina - I may take you up on that Williamsburg idea! I just watched the A&E movie Benedict Arnold this weekend and my love for the 18th century colonial period is running high. Adge, I like Thomas Jefferson because I heard he was a redhead. Any truth to that? It sounds sooo beautiful. I long to go there and to Charleston. Although I have lucked out and been to Williamsburg. Virginia, I have to say that I appreciated your reminiscences so much. I love to hear tales of the way things used to be. You brought it to life and made me yearn to have been a part. We historical writers love details like that. Thank you! Hi, Lisa! Thank you for letting me ramble : ) In my family, before me, there is a long line of very funny, very Southern women. My Mama was the most entertaining of the bunch. She had a flair for drama, a piercing wit (I still have scars), and a grand storytelling style. My grandmother was extremely intelligent, also with the piercing wit, and the best cook ever! My great-grandmother was a true diva. Her second husband was a very wealthy man who co-owned a steel firm in Baltimore, MD. Don't know where that money went : ) She lived life on her own terms, drove like a wild woman (with or without a license) and had her own smokehouse...for hams & such! Oh wow, I am so envious. I'd love to visit Williamsburg. You all have described everything beautifully! Deb, What a fabulous post. The GA Tourism dept should hire you. Now I've got to go make notes on those places. I have been to Savannah. I was eleven years old. My best friend moved there, as her dad worked for a luxury hotel chain. At the time, my grandparents lived in another southern state, and during our annual visit to their house, my family hopped down to GA since we were already "in the neighborhood" ... it was a twelve hour drive, but eh! I remember how beautiful the buildings were, especially the mansions we visited. I was moved by seeing slave quarters with my own eyes, after reading about them. I also remember walking under trees covered in Spanish moss, and seeing a statue of Wesley. My parents got a kick out of that, as they're Methodists. I'd love to go back now that I'm an adult! Thanks for the fabulous post! I'm in the mood for vacation! Both cities sound wonderful! I've never been to either and would like to go sometime. Have been to Williamsburg, VA numerous times; we actually honeymooned there:) Love that city too. Ellen Robillard - something to do with Gone With the Wind? Thanks for sharing the thoughts and pictures! KAREN LANGE - You're my hero! Ellen is Scarlett's mother and she is from the beautiful city of Savannah! I can't send you a grand prize of a weekend getaway but I'll send you wishes that you can get to Savannah or Charleston sometime. Maybe a second honeymoon! WOw, your hero, that's a big compliment! :) No grand prize necessary; a visit to one of these fair cities someday will compensate nicely. I'll be thinking of you when I visit! Thanks for the tour, Deb! I haven't been to Savannah, but I have been to Charleston. My favorite memory was going to a huge outdoor market. It was held in a place that used to be a slave market, but now, people of all colors sell their wares there together, including some African American ladies who were weaving sweet grass baskets. That was a great trip! Jen, I've been to Charleston and that market myself. I bought a print that I had framed. "Painted lady" houses along the waterfront but with a twist- facing a storm. I love it, and it's a great memory of that visit. My mom bought a sweetgrass basket (We wished we could have bought some more). Any balls or afternoon teas I can attend, Scarlett? Have a new ball gown made up, get out the fan, and maybe sample a delicious punch! Or sit out on a lovely veranda....Pat I.
I'll have to confess right now that I'm a Northern girl and have not spent any time in the romantic south, just a couple quick pass-throughs and time at Disney World. I'm sorry to say. Write about, hmmm, jazz music and blenders. Ha, ha. Jazz music and blenders. I like that one. I have John Berendt to thank for my love affair with Savannah. Who could read "The Book," and not want to venture to the south to explore the town full of secrets and ghosts and adventures to no end? 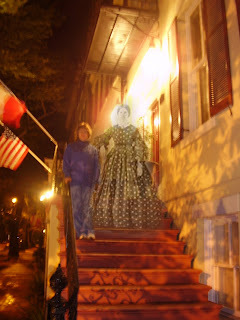 I love spending the day on Tybee Island, followed by a night of dining and cocktails, roaming the streets and getting the locals to share their best ghost stories. The Long Road to "The Pastor's Wife"
Are you sure that's in the Bible? Where Does a Novel Come From? Because you're worth it, baby! Taking Care of You? Get a Counselor!